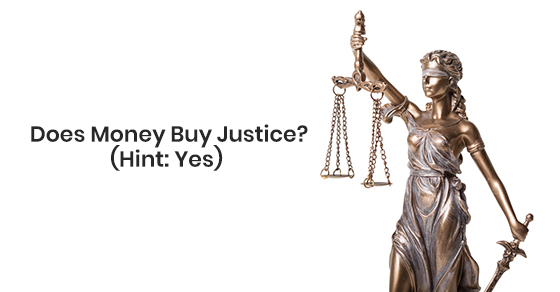 Can money buy justice? Not surprisingly, the answer is often Yes. 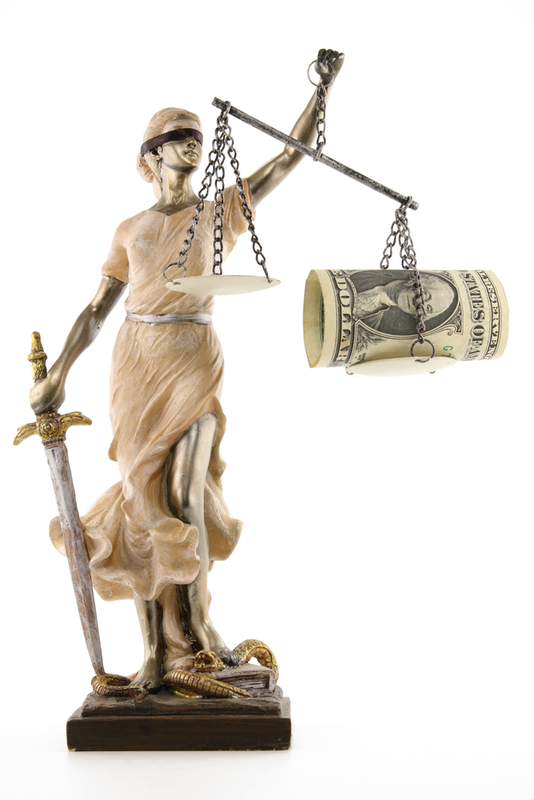 Despite the important principle that justice should be “blind”, and treat each individual equally, the reality is that two defendants, charged with the same crime in the same circumstances, face quite different prospects in court when one of them can afford to pay for good legal representation. Legal Aid can help to lessen the gap between those who can finance their defence and those who cannot afford to do so. But Legal Aid has serious limitations: only the poorest of defendants are eligible for Legal Aid, and usually only for the most serious cases, where jail is a virtual certainty upon conviction. And Legal Aid limits what it pays to cover legal expenses, which often prevents one from hiring needed experts, bringing motions or investigating potential leads. But worse than the limitations of Legal Aid is the fact that most people who cannot afford a lawyer are nevertheless not poor enough to qualify for it. The courts are full of individuals who are forced to try to represent themselves in court, to often disastrous effect. There is no replacement for being able to pay for your own lawyer to properly represent you. But beyond that, the fact is that often people who can afford to pay for their own lawyer enjoy advantages that those less affluent do not have access to: a safe and secure childhood; a quality education; access to mental health support; and good jobs. These benefits can mean the difference in court between innocence and guilt; jail or no jail. The affluent are often affluent because they were raised that way, or received the education and social and family support to enable them to thrive. They have the “roots in the community”, the jobs and family and support that result in courts designating them as “good prospects for rehabilitation” and “low risk to re-offend” and given lesser sentences as a result. Those who are more marginalized, suffer from poverty, addiction, abuse, mental health issues (or a combination of all of these) just don’t present as well in court. They won’t testify as articulately, or have accomplished supporters lined up to provide compelling reference letters. This contrast was driven home to me recently, when I represented a client who was being sentenced on a serious assault charge. Two young defendants, both university students, had been found guilty. The victim of the assault was seriously injured, and a jail sentence was a certainty- the question was how long. My client was a university student who had excelled in school and work; had the support of family, friends, teachers, coaches and employers. He filed dozens of glowing references. When he was initially suspended from school after the assault, he and his family were able to quickly arrange the counselling and psychological assessment he needed to be re-admitted to his program. On the other hand, the other defendant, also a university student, did not enjoy the same advantages. He attending school on financial aid, and was represented in court on a Legal Aid certificate. He had been in trouble with the law before, because his childhood friends from his neighbourhood weren’t as polished as those of my client. As the son of refugees with high expectations for him, he was too embarrassed to tell them about his legal troubles. So he had no one in court to support him. He did not have dozens of references; in fact, he had no one he felt comfortable confiding in. When he was suspended from school, it took him two years of working two jobs to save up enough money to pay for the assessment that would get him re-admitted to school. Fortunately, the sentencing judge noticed the stark contrast between the two young men he was about to sentence. He gave my client credit for his accomplishments and remorse, but he also gave the other defendant credit for having come as far as he had with his education, having shown resilience, determination and inner strength to rise to the many challenges he faced. But many defendants are not so lucky, are not seen as having surmounted obstacles despite getting into legal trouble. Sometimes it is because they haven’t been able to surmount those obstacles; sometimes it is because they simply cannot put together the well-researched, fully prepared, polished presentation that will win the day in court. And these differences result in a disproportionate number of the poor, less-educated, mentally challenged being found guilty and being sentenced to jail. Human beings, despite their common physical attributes, grow up and live in a wide variety of circumstances. Some are luckier than others. But to the extent that our society can try to ensure that each individual is given a fair chance at Justice in court, those measures should be adopted, whether it is through more funding for Legal Aid; more awareness by judges of the effect of poverty and racialization on the justice system; to returning more discretion to judges to take into account the personal circumstances of an offender, rather than “cookie-cutter” sentencing rules and policies. It is only by “seeing” people for who they are, and the challenges they face, that Justice can truly be “blind”. Arun S. Maini is a criminal lawyer and former prosecutor with over 20 years of experience.He practices across the Greater Toronto Area from offices in Toronto, Vaughan and Oakville.